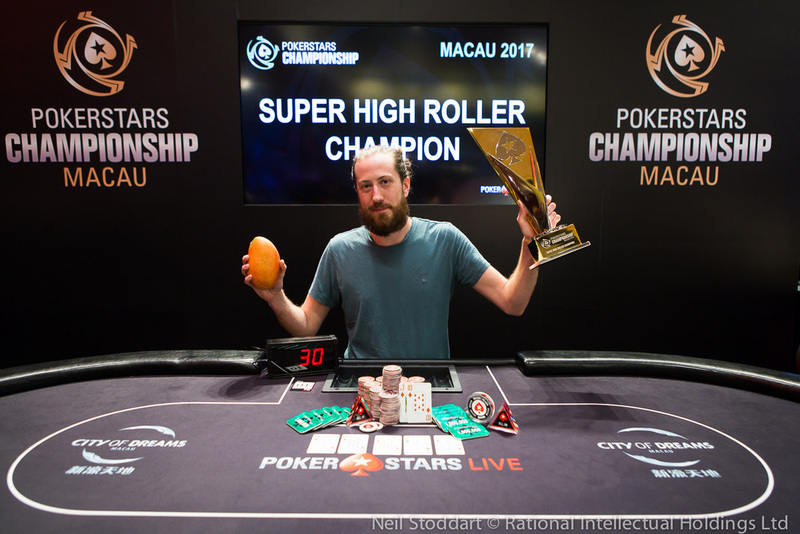 Steve O'Dwyer has won yet another Super High Roller event, taking down the HK$400k Super High Roller at PokerStars Championship Macau. O'Dwyer, 34, outlasted an 88-entry field, and received HK$8,460,830 after cutting a heads-up deal with former WCOOP champion Fedor Holz. O'Dwyer will celebrate his birthday on Thursday and couldn't have given himself any better present than this seven figure result, along with another trophy for his extensive show-case. Today's payday puts O'Dwyer's live earnings well over $17.5 million and comes only two weeks after he won the PokerStars Championship Panama $10k High Roller for $240,45. The PokerStars Championship is only halfway through its third stop but O'Dwyer has already accomplished two thirds of the golden treble: Day 1b of the Main Event is today. An extraordinary talisman - a mango - helped O'Dwyer reach the Super High Roller victory. After taking down the tournament, O'Dwyer told the PokerStars Blog: "I think I've used up all the luck with the mango winning this tournament," before adding that he now intends to eat it. Holz, who took HK$6,749,170 for his runner-up finish, has now moved to seventh place on the all-time money list, ahead of the legendary Phil Hellmuth. He's amassed over $21.7 million in live cashes. O'Dwyer had a four-to-one chip lead when he and Holz agreed a deal. There were 88 entries to the tournament, from 64 unique players. The total prize pool was HK$33,802,560 with 13 paid. Day 1a of the HK$42,400 PokerStars Championship Macau Main Event attracted 193 runners. Chinese player Zigao Yu is the chip leader, bagging up 162,900. The 34-year-old is leading the pack of today's 117 survivors. Day 1b takes place today.